Discussion in 'Other Breeds' started by kylegep, Jan 24, 2015. I was wondering if anyone had information on this breed or owns one? I was reading on them and I'm seeing mixes of info. Some people say they have DA and others not. Any info helps, thanks!! I have a mix. He's selectively DA. Some do, some don't. About like anything else. Ask what the relatives are like before you buy. My Griffin's very best playdate friend is a female Dogo, she's about 2 years old. She is very stable and calm, aloof but not aggressive or unfriendly towards the other dogs in the two group classes we were in together. With Griffin she is crazy friendly, they are in a little bit of puppy love, with some chaos and slam dancing added in. Her owner told me that she is quite headstrong and needs lots of structure, and she is very protective of her and her farm and other animals, which is just what the owner wanted in a dog. She is one helluva cool dog, I'm pretty smitten with her, too! Overall, I think they are an impressive breed, but need a working home and strong handler. 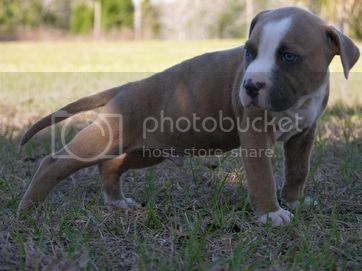 It will be years before I get one but man are they beautiful dogs. I know they hunt in packs and the originator did the best to breed out HA and DA. Do you guys have an pics of them? What about the drive from a dogo argentino? they come near a pit bull? How do you mean what i mean? what part u don,t understand? He probably means what do you mean about the drive being like a pit bull... What kind of drive? What kind of information are you actually looking for? Was that rude? English is not my native language, it was not my intention to be rude. I see. In that case, my apologies. My Dogo mix has plenty of go in him. I'm sure the (well bred) purebreds are no different. There are different kinds of drive, often depending on the breed you're referring to so sometimes you have to be more specific. Yeah what I meant was what are you asking? The sentence was a little weird and English not being your language is understandable. Are you asking if dogo's drive and pitbulls are the same? Or telling me that they are hard to control? No I think he means that the Dogo is high energy with the drive to work until the job is done (until the handler says it's done).... Which, in my experience, is true. Okay, makes sense! They look like a hard working breed. Would like to have one . Very nice looking dogs. This is what i mean. Also, I am wondering if the dogo is tested on a form of gameness. I mean: all had to ignore pain while fighting pitbulls in the pitt, and had to with a wagging tail on. Only the dogo had to this too, only then may hunt. What is the difference? There is a hunt test for dogo's. It is not required for them to be papered. The dogs were breed for boar hunting and jaguar hunting . The only game ness test they will recieve is actually hunting. I have talked with lots of folks that use them to catch wild boar. Most seen to like them. Keep in mind boar hunting is not boar fighting. When the dog is turned loose the owner is right behind to throw and dispatch the boar. This may only take 1min or half an hour. It all depends on the dogo. I've seen some that I'd trust with any hog, and had one turn loose a hog that I was about to leg. I've heard a lot of stories about them backing up and baying instead of catching. I'll just say it all depends on the dogo you get. There are some really good ones out there, and some worthless. They are a pretty good cash cow right now so be careful what you buy. I doubt I will ever go looking for one when I need a catch dog, but if the right one fell in my lap then maybe. They tend to be bigger than what I really want. I have one catch dog that's 1/2 dogo now, but I knew her mother, knew the people very well that I got the dog from, and she hunted for me for two months before I handed over any money. Truth is I never had any intention of keeping her. She was a loaner. My other catch dog had died and I needed another one so these people lent her to me so she could get some experience and I could have a catch dog. It seemed like a win win situation. Only thing was after a couple months I decided that even if she is bigger than what I like, I didn't think I was going to do any better for a catch dog. I made an offer, they accepted and she's still here and will likely die of old age on my yard. Just remember, if you do decide to get one, you're gonna shell out a lot of money, and may end up with good or bad. You're buying the man, not just the dog. You're buying the effort, or lack thereof that he put into his dogs. You might be buying something that someone has put decades of effort into, or you might be buying somebody that just threw Handy in with Ready and started advertising. Dogo is an amazing dog, HOWEVER, it needs a lot of space and exercise, otherwise it get psycho. Dogo is stable and amazing when you have a farm and life who matches the dogo creation (hunting, sports, etc). ps. : btw, have you seen a dogo hunting a big java ? f%%% amazing !